two peas & the dog: food. red coconut curry lentil and sweet potato soup. food. red coconut curry lentil and sweet potato soup. As soon as Nate said "best soup you've ever made", I jumped on my laptop to share the recipe. Seriously, I'm pretty impressed with this Donna Hay recipe. From the original photo in the magazine, I thought - oh, recipe said no cream but I think we'll need to get some. That is certainly not the case. This delicious and healthy soup recipe is the perfect cool night dish. Open a bottle of wine (our choice was a 2009 Mollydooker Blue Eyed Boy) and enjoy. 1. Heat the oil in a large saucepan over medium heat. Add the shallots and cloves, sauté until tender. 2. Add the ginger, sauté for about a minute. 3. Add the Thai Red Curry Paste, sauté for about a minute. 4. Add the sweet potatoes, chicken stock, coconut milk, fish sauce, lime juice. Cook until sweet potatoes are tender, about 10-18 minutes. 5. 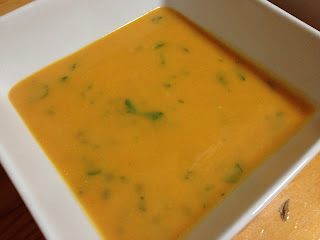 Remove soup from heat and blend with either an immersion blender or add soup to a food processor and blend in batches. 6. Move soup puree back to low heat and fold in lentils and coriander. Heat through for about 5 minutes. Don't forget the crusty bread! This recipe is easy to prep, easy to cook, easy to finish.